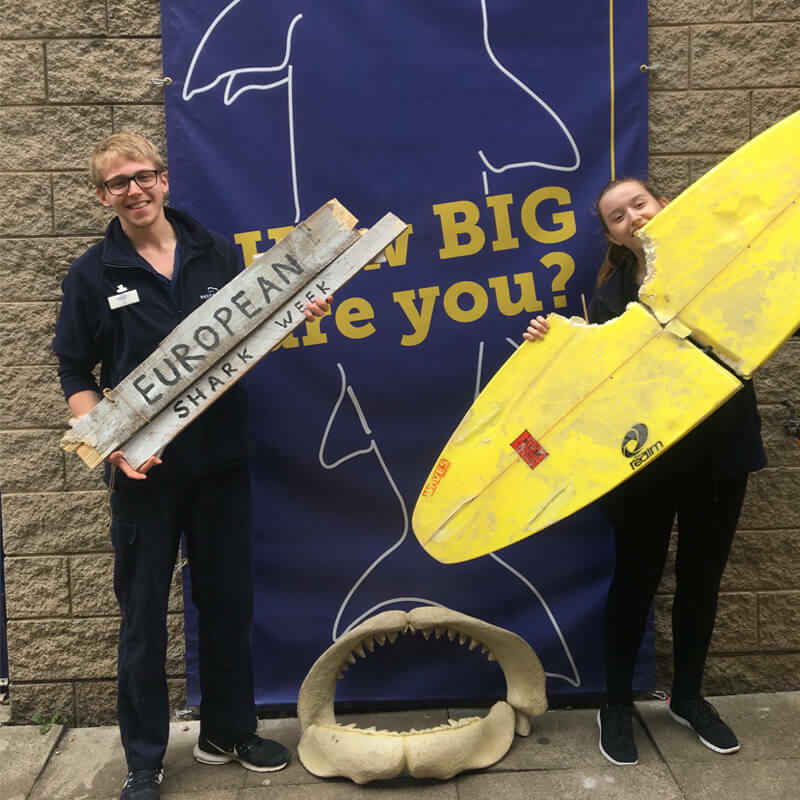 If you love sharks as much as we do at Deep Sea World, join us this July for a special themed event celebrating European Shark Week. Head to the aquarium from Saturday 22nd to Sunday 30th July and enjoy a whole host of activities and talks centred about the world’s underwater giants. The ocean is such a vast space that it’s often hard to imagine how many fascinating creatures are living in the waters (and how many more have through history). We’re giving you the chance to explore a range of shark paraphernalia at our touch table stations. For those feeling especially brave, why not pick up a tooth from the menacing Megalodon? Believed to have roamed the oceans 2.6 million years ago, Megalodon holds the title for the largest shark species to ever live and is one of the largest predators recorded in history – measuring approximately 52 feet, the shark was a whopping 3 times longer than the longest Great White shark! The shark’s teeth are so big that they have often been mistaken for rocks or mythologically as dragon and giant serpent tongues. Come and see these fascinating snippets of history from one of the most foreboding creatures for yourself! Sharks come all in all shapes and sizes but one thing all shark species are known for is their vast mouthful of teeth. Some sharks can actually shed up to 35,000 teeth in a lifetime! Compared to us humans, who only ever have about 52 teeth in a lifetime. Sharks are also known to have more than just one top layer and one bottom layer of teeth. Some species actually have as many as 15 rows of teeth. As such, we’re sure sharks have a pretty big grin! As well as Megalodon teeth, we’ll have selection of shark jaws and shark skin for you to touch – prepare to be wowed by the sheer scale of shark jaws and surprised by the rough feel of shark’s skin. And, if you want to see the true power of a shark’s impressive munch, check out our shark-bitten surf board. Contrary to popular belief though, sharks aren’t always the ferocious creatures they may appear to be. Sharks often break the water’s surface at the sight of a surfboard because they mistake it for that of a tasty treat – a seal, a walrus, or a sea lion – rather than to attack a human. Did you know that rays are related to sharks? And have you ever wondered how our beloved ‘flat fish’ give birth? They do so through egg cases known as ‘mermaid’s purses’. Make sure you pick up one of these magical cases at our touch table. Conservation is really important to us at Deep Sea World. That’s why we’re part of a dedicated angel shark-breeding programme and continue our efforts to help protect the creatures in oceans all around the world. For our Shark Week event, we’ll be teaming up with Shark Trust, who are celebrating their 20th anniversary. You can learn more about how to protect your local shoreline and ocean, as well as how to contribute to the wider picture of conservation. Pop along to our gift shop to pick up your own Shark Trust badge, with proceeds going to the charity, to help look after the future of sharks big and small. Come join us for a week of fun and fascinating facts this July! Get clued up on the sharks that live in Scotland’s waters before your visit. Don’t forget to head on over to our Underwater Safari – the longest underwater walkway in Europe – to see many different sharks and rays up close. Purchase your tickets online to make the most of our exciting discounts. Want to learn more about the ocean? We’ll also be celebrating National Marine Week with a fortnight of special activities taking place from Saturday 29th July to Sunday 13th August. Check back soon for more details!